'Cena Romantica'. 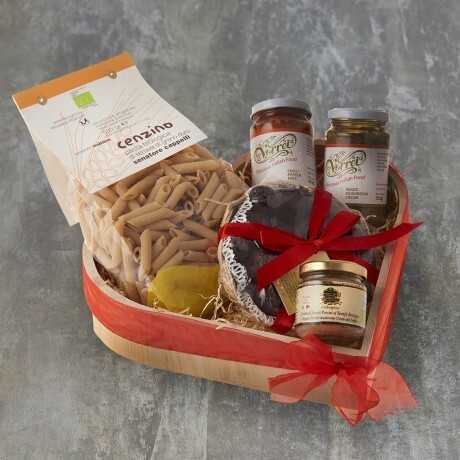 Everything you need for that special Valentin's meal…and so easy to prepare! The wooden heart shaped gift tray includes two delicious spreads which are perfect for topping antipasto bruschette - Sun Dried Tomato, Pistachio & almond and mild Chilli Pepper (both 180g), followed by a 'primo' or first course of Organic Bronze Die Cut Penne Pasta (500g) with an Organic Truffle Ready-Made Sauce (90g). End the meal with some heavenly Dark Chocolate Coated Dried Figs (200g), all beautifully presented in this lovely tray tied with a pretty ribbon. Add a personalised message for a special touch.